Home decor is difficult to grasp when you’re dealing with a newly-purchased or rental apartment that's a blank canvas. Whether you’re after interior design ideas for a small studio apartment, or you’re living the high life in a penthouse, there’s a magic to apartment decorating to make yourself feel at home. We reached out to the best in the business, Sally Walvin from Creating Style to share her home decor advice for your apartment. Sally recommends picking a simple colour scheme as a starting point for apartment decorating to incorporate throughout your home decor - while you may not be able to paint walls, you can still add your personality and make the space your own. If your bedroom is in need of some personal touches, Sally recommends getting an upholstered bedhead. This can add character to a blank wall, and from there, you can incorporate more bedroom accessories in matching tones to your home decor. Introducing statement rugs, cushions and accessories such as vases and books is a great place to start. If that isn’t enough to fill all of your empty wall space, and you don’t want to face your landlords’ wrath from hammering holes in their walls, there is an alternative option. Command picture hanging strips are a great solution for hanging artwork, with minimal wall damage. 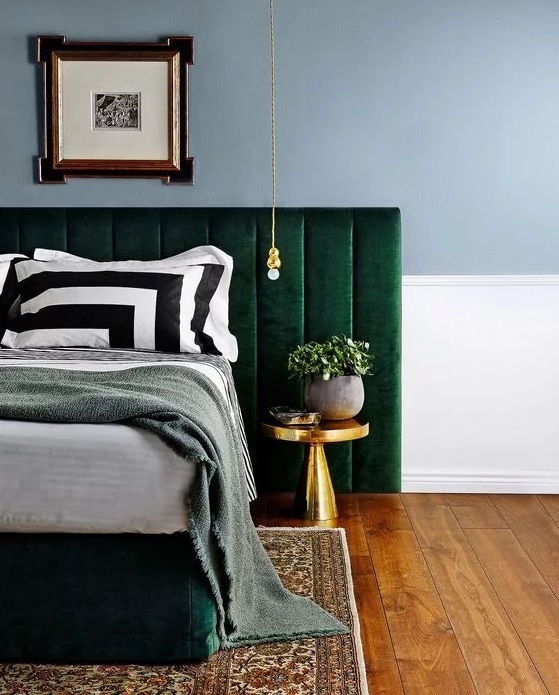 If you don’t mind straying from tradition with your interior design, you can even place artwork on bedside tables and counters for a finishing touch without the fuss. When it comes to interior design ideas to create ambiance, texture is your answer. This can be in the form of fluffy throws, marble side tables and glass accessories, or lamps with contrasting bases and shades. Sally also recommends incorporating a statement piece of furniture into your apartment decorating, such as an armchair, a vase or a picture frame. Open shelving is a great home decor solution to take up some of that empty wall space. This creates a focal point that is both practical and attractive - as long as you keep it tidy! Store your favourite books, candles and collected treasures while making them a feature of your apartment decorating. This creates an effective focal point and saves the added clutter that can end up on coffee tables and bench tops. Last but not least, don’t underestimate the power of greenery. Plants are a great interior design idea to fill empty corners, tie a room together and keep it fresh. Even if you don’t consider yourself a green thumb, artificial plants are extremely high quality these days. Once you’ve picked out your perfect piece of fauna, Sally recommends picking out a statement pot for it to take residence in.